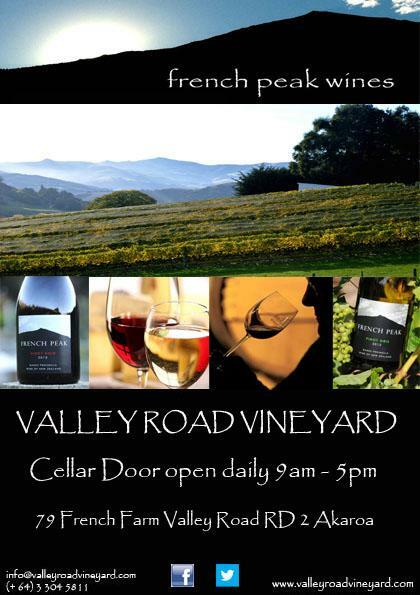 Valley Road is a boutique, family-owned vineyard set in the idyllic French Farm Valley. Planted with approximately 4 Ha of vines, including Pinot Noir, Pinot Gris and Chardonnay. The sunny sheltered aspect and the volcanic soils produce distinctive Banks Peninsula fruit at Valley Road vineyard, which patiently nurtured, hand picked and then crafted into unique wines. Valley Road Vineyard has just produced its third vintage of wines under the French Peak label. Our wines are available for purchase in a range of local shops and restaurants, or direct from our cellar door on the vineyard.